. : Optics & Photonics Focus :: Astronomical Twisters :. Detecting the twist of a black hole. The light emitted near a rotating black hole acquires a characteristic orbital angular momentum, which may be detected from Earth by using an appropriate set of radio telescope arrays and data analysis techniques. Figure courtesy: Fabrizio Tamburini, University of Padua. Black holes are one of the most intriguing predictions of Einstein’s General Relativity Theory. These incredibly massive astronomical objects have yet to be seen; neither is there hope of ever seeing one, since nothing, not even light, can escape their huge gravitational attraction. Luckily, we can still hope to trace their trail. It is possible, for example, that a rotating black hole imparts small twists to the photons passing close by, and this should be detectable from Earth, providing, en passant, further evidence in favor of Einstein’s General Relativity Theory. This is the proposal of an international group of researchers from the University of Padua (Italy), the Ågström Laboratory (Sweden), Macquarie University (Australia), and ICFO – the Institute of Photonic Sciences (Spain). According to Einstein’s General Relativity — a central cornerstone in our understanding of the Universe, with many scientific and technological implications — the presence of massive objects alters the fabric of space-time. An empty two-dimensional space-time, for example, can be visualized as a plastic piece of foil lying flat, which wraps where a mass, say an apple, is placed. We can detect the presence of such wrap by observing the motion of objects passing nearby: the trajectory of a marble will bend near the plastic foil wrap, and, analogously, the trajectory of a photon will bend near a space-time wrap. A black hole occurs when the curvature of the space-time is so large that not even something traveling at the speed of light, such as a photon, is able to escape; the space-time wrapping near a black hole has a distinctive structure and its fingerprint is transferred onto the radiation emitted nearby. Black holes were first proposed in the 18th century by John Michell and Pierre-Simon Laplace, as objects whose gravitational force was so large as to retain even something capable of traveling at the speed of light. However, it was not until a century late that the advent of Einstein’s General Relativity brought black holes onto solid theoretical ground: it was found that a black hole may be generated by the collapse of a star with a mass at least several times that of our Sun’s. In 1963, Roy P. Kerr demonstrated that General Relativity also permitted the existence of rotating black holes . However, how could we possibly detect the presence of a rotating black hole? "We went back to an idea put forward by Enrico Fermi," explains Fabrizio Tamburini from the University of Padua, "in which he considered how a rotating gravitational lens produced an effect on the light passing nearby." "From Einstein's General Relativity," adds Bo Thidé from the Swedish Institute of Space Physics at the Ågström Laboratory, "any rotating massive body drags with it space and time, a phenomenon known as frame dragging. This should induce a twist, known as orbital angular momentum, on a nearby passing light beam. This effect should be particularly evident around a massive rotating black hole." In our simile, if a plastic foil (the space-time) is dragged by an apple (the rotating black hole) spinning on it, it will acquire a characteristic twist, which can be transferred onto a marble (a photon) passing nearby. Orbital angular momentum (OAM) is one of the properties of photons, as is their wavelength or their color . Unlike wavelength and color, however, OAM has not been exploited by astronomers until now. "In 2003, Martin Harwit  wrote a provocative paper saying that astronomers use light, but only a minimal part of it," remarks Tamburini. "In particular, they don't take advantage of its orbital angular momentum." In 2007, Thidé proved mathematically that with a certain antenna one can generate or detect beams carrying OAM at radio frequencies  and he started to look for an astronomical phenomenon that would induce a significant amount of OAM to make it detectable. "I went to various universities and institutes presenting this work," recalls Thidé, "until we came up with the idea of looking at the light generated near the space-time wrap of a rotating black hole." Studying the solution to the equations of General Relativity in the proximity of a rotating black hole, they found that some light generated nearby would indeed acquire some OAM — enough for it to be detectable from Earth. 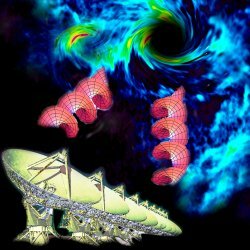 "We solved the equation of General Relativity using a powerful computational technique, which permitted a very fast solution, and could even be done on a laptop," explains Tamburini. "We carried out an optics experiment using a rotating black hole." The next natural step will be to try to detect OAM in astronomical signals. "We are looking into the possibility of using the Very Large Array (VLA) telescope in New Mexico (USA), or the Atacama Large Millimeter Array (ALMA) telescope in Chile, to do this measurement," explains Thidé, "but maybe data containing this information already exists, since several telescopes have observed the radiation generated from the regions surrounding black holes. Except that no one, to date, has specifically looked for the OAM. A success in detecting the signature of OAM in the radiation coming from the proximity of a rotating black hole would not only be strong evidence for the existence of black holes, but it would also provide a strong confirmation of the validity of Einstein’s General Relativity. "The real novelty of our result is that we found a new effect owing to General Relativity, namely that the electromagnetic radiation emitted near a black hole, an enormously massive rotating object, carries with itself information about the local wrapping of space," observes Thidé. "By measuring the phase map of the OAM we can now test Einstein's General Relativity using radio telescopes. This is what we are most proud of." R. P. Kerr, Gravitational Field of a Spinning Mass as an Example of Algebraically Special Metrics, Phys. Rev. Lett. 11, 237–238, 1963. G. Molina-Terrizza, J. P. Torres & L. Torner, Twisted Photons, Nat. Phys. 3, 305-310, 2007. M. Harwit, Photon Orbital Angular Momentum in Astrophysics, Astrophys. J. 597, 1266–1270, 2003. B. Thidé et al., Utilization of Photon Orbital Angular Momentum in the Low-Frequency Radio Domain, Phys. Rev. Lett. 99, 087701, 2007. Fabrizio Tamburini, Bo Thidé, Gabriel Molina-Terriza & Gabriele Anzolin, Twisting of light around rotating black holes, Nature Physics (2011) 7, 195-197 (link).